We advise all bidders to read the Terms and Conditions of the Sale before bidding with Ben H Royston Auctioneers. Those who bid are bound by those Terms and Conditions of the Sale, as amended by any oral announcement or posted notices, which together form the contract of the sale between the successful bidder (purchaser), Ben H Royston Auctioneers and the seller (consignor) of the lot. INSPECTION: The bidder is invited, urged and cautioned to inspect the property prior to bidding. Property will be available for inspection at the places and times specified. Persons in attendance during inspection, sale or removal of merchandise assume all risks of damage or loss to persons, property, or merchandise and shall exercise proper precautions at all times for the protection of persons and property and shall comply with all safety and health requirements as directed by Auctioneer, and local, state and federal regulations. Auctioneer, its agents, its employees and representatives shall not be liable by reason of any defect in or about the condition of the premises on which the auction is held. Buyer specifically releases Auctioneer, its agents and representatives from all liability thereof. CONDITION & LOCATION OF PROPERTY: All property listed is offered for sale “AS IS, WHERE IS” unless otherwise provided. Ben H Royston Auctioneers nor the consignor makes no warranty, expressed or implied as to quantity, kind, character, quality, weight, size or description of any of the property or its fitness for any use or purpose. CONSIDERATION OF BIDS: Ben H Royston Auctioneers as a commissioned agent for the consignor reserves the right to reject any or all bids including all bids under which a bidder would take unfair advantage of the consignor or other bidders, to waive any technical defects in bids, and unless otherwise specified by the consignor or by the bidder, to accept any one item or group of items in the bid, as may be in the best interest of the consignor. FORMS OF PAYMENTS: Cash payments shall be in US currency, Cashier’s Check, and Traveler’s Check, Wire Transfers, Money Order. A personal or company check will ONLY be accepted when accompanied by a bank letter guaranteeing payment and valid driver’s license. If this is not provided, Ben H Royston Auctioneers reserves the right to require another form of payment. PAYMENT: The purchaser agrees to pay for property awarded to him in accordance with the prices quoted in his bid. Subject to any adjustment made pursuant to any provisions of this contract, payment of the full purchase price must be made the day of the sale within the time specified in the flyer or website. ALL SALES ARE FINAL: The condition of the merchandise being offered varies. Buyer understands and agrees: (1) that any description or sample of the merchandise given or furnished by Auctioneer is solely for identification, and does not create any warranty, express or implied, that the merchandise actually conforms to such description or sample; (2) that all merchandise is purchased and accepted by Buyer “AS IS-WHERE IS, and “WITH ALL FAULTS, KNOWN AND UNKNOWN.” AUCTIONEER MAKES NO WARRANTIES OR GUARANTEES WHATSOEVER WHETHER WRITTEN, ORAL OR IMPLIED AS TO QUALITY, QUANTITY, CONDITION, LOCATION, USEABILITY, SALEABILITY, WEIGHT, MEASUREMENT, YEAR, MODEL, MECHANICAL CONDITION, PERFORMANCE, AND FITNESS FOR A PARTICULAR PURPOSE OR OTHER SPECIFICATIONS. MANUFACTURERS WARRANTIES MAY BE IN EFFECT. NO SALE SHALL BE INVALIDATED AND AUCTIONEER SHALL HAVE NO LIABILITY FOR A MISDESCRIPTION OF ANY ARTICLE OR LOT WHETHER CONTAINED IN A CATALOGUE, ADVERTISEMENT OR OTHERWISE. Descriptions have been prepared for guide purposes only and shall not be relied upon by Buyer for accuracy or completeness. By submitting a bid, Buyer/Bidder affirms it has inspected all items or has waived its right to do so prior to bidding. Buyers shall be deemed to have relied entirely upon their own inspections and investigations. TITLE: Unless otherwise provided in the flyer, title to the property sold here under shall vest in the purchaser as and when removal is affected. On all motor vehicles and motor propelled or motor drawn equipment requiring licensing by a state motor vehicle regulatory agency, a title or proper documents for title will be furnished for each vehicle and piece of equipment unless otherwise provided in the flyer. DELIVERY, LOADING, AND REMOVAL OF PROPERTY: A. The purchaser shall be entitled to obtain the property upon full payment therefore with delivery being made only from the exact place where the property is located within the installation. The purchaser must make all arrangements necessary for packing, removal, and transportation of property. Ben H Royston Auctioneers will not act as a liaison in any fashion between the purchaser and carrier. Loading will only be performed as set forth in the flyer. Ben H Royston Auctioneers will provide the initial placement of the property on conveyance(s) furnished by the purchaser and the initial placement on the purchaser’s conveyance(s) shall be as determined by Ben H Royston Auctioneers. C. Items purchased under the sale catalog will be released only to the purchaser or his authorized representative. The authorized representative must furnish authorization from the purchaser to the custodian of the property location before any delivery or release will be made. When property is described as being boxed, packed, crated, skidded, or in containers, Ben H Royston Auctioneers does not warrant that the property, as packaged, is suitable for shipment. D. Segregation, culling, or selection of property for the purpose of effecting partial or incremental removals will not be permitted except as specifically authorized and prescribed by Ben H Royston Auctioneers. E. Buyer is solely responsible to provide any personnel, equipment or material needed to pick up purchases and shall assume all responsibility for the removal of any item of property purchased at the sale and any and all risks associated with such removal including, without limitations, the responsibility for providing LICENSED AND BONDED professionals to ensure proper water, gas and/or power disconnection, disassembly, removal and loading, and full financial responsibility for any damage or liability to persons or property resulting from any negligent act or omission of Buyer or Buyer’s employees, agents and/or representatives during pick-up and removal. REMOVAL TIMES: All property must be paid for and picked up in the time frames announced by Auctioneer at time of sale. If not, the merchandise will be deemed abandoned and Buyer will lose any right, title or interest Buyer may have acquired and the merchandise shall revert and repossess to Auctioneer without further notice to Buyer and Buyer’s deposit will be forfeited. No purchaser may assign, transfer, or dispose of his rights in any article purchased before he has paid the purchase price in full. No reselling will be allowed from the premises. 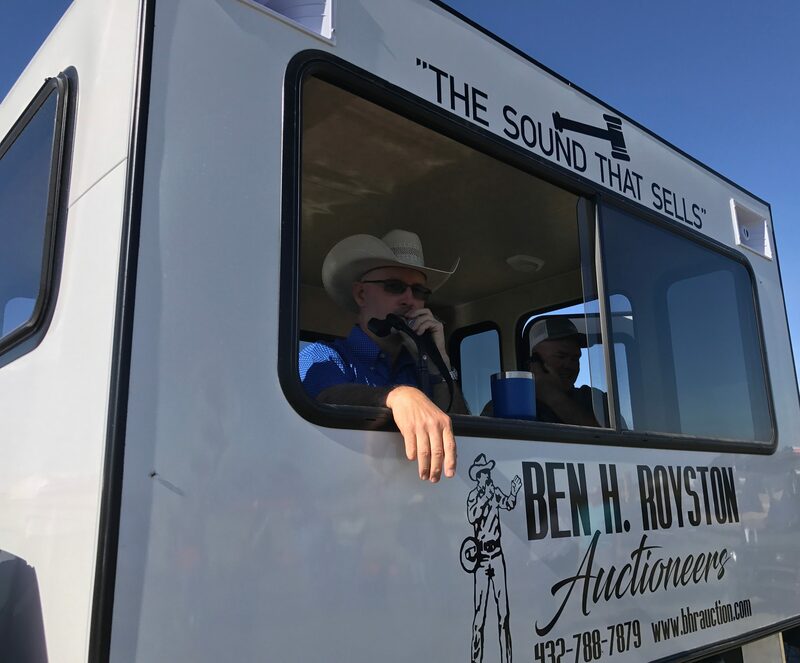 ORAL STATEMENTS AND MODIFICATIONS: Any oral statement or representation by any representative of Ben H Royston Auctioneers, changing or supplementing the flyer or catalog or any condition thereof, is unauthorized and shall confer no right upon the bidder or purchaser. Further, no interpretation of any provision of the contract, including applicable performance requirements shall be binding on Ben H Royston Auctioneers unless furnished or agreed to, in writing by the supervisor or his designated representative. CLAIMS LIABILITY: The bidder or purchaser agrees to save Ben H Royston Auctioneers and Consignor harmless from any and all actions, claims, debates, demands, judgements, liabilities, costs, and attorney’s fees arising out of, claimed on account of, or in any manner predicated upon loss of or damage to property and injuries, illness or disabilities to or death of any and all persons whatsoever, including members of the general public, or to the property of any legal or political entity including state, local or interstate bodies, in any manner caused by or contributed by the bidder or purchaser, it agents, servants, employees, or any person subject to its control while in, upon or about the sale site and/or the site on which the property is located, or while the property is in the possession of or subject to the control or the bidder or purchaser, its agent, servant or employees after the property has been removed from Consignor’s control. RISKS: All risk loss shall pass to Buyer at the time of payment. If Auctioneer is unable to deliver an article sold to Buyer due to fire, theft, or any other reasons whatsoever, Auctioneer shall reimburse Buyer for all monies paid to Auctioneer in respect to the article and Auctioneer shall have no further liability to the purchaser arising from or relating to such loss, including without limitation any damages for loss of profits. LIABILITY AMOUNT: In no event shall Auctioneer’s liability to Buyer exceed the purchase price actually paid. A Buyer’s claim shall be limited to the amount paid for the merchandise, and shall not extend to any obligation; risk; liability; right; claim; remedy for loss of use, revenue or profit; liability of Buyer to any third party; personal injury; or any other direct, indirect, incidental or consequential damages. Auctioneer is acting as an agent only and is not responsible for the acts of its principles. WITHDRAWAL OF PROPERTY AFTER REWARD: The Consignors reserves the right to withdraw for its use any or all of the property covered by this contract, if a bona fide requirement for the property develops or exists prior to actual removal of the property from Ben H Royston Auctioneers control in the event of a withdrawal of this condition, Ben H Royston Auctioneers shall be liable only for the refund of the contract price of the withdrawn property or such portion of the contract price as it may have received. ELIGIBILITY OF BIDDERS: The bidder warrants that he is not: (a) under 18 years of age; (b) an employee of the consignor where the consignor prohibits the employee from bidding. For breach of this warranty, the Ben H Royston Auctioneers shall have the right to annul this contract without liability. REQUIREMENTS TO COMPLY WITH APPLICABLE LAWS AND REGULATIONS: It is the bidder’s responsibility to ascertain and comply with all applicable federal, state, local and multi-judiciary laws, ordinances, and regulations pertaining to the registration, licensing, handling, possession, transportation, transfer, export, processing, manufacture, sale, use, or disposal of property listed in the invitation. Purchasers or users of this property are not excused from any violation of such laws or regulations either because the United States is the party to this sale or has had any interest in the property at any time. IMAGE, AUDIO & VIDEO RECORDINGS: Ben H Royston Auctioneers shall have the right to make image and audio video recordings of the auction, to use said recordings at its own discretion, and if deemed appropriate to make this public. Participants give their permission by participating in the auction. SALES TAX: Buyers will be charged all applicable taxes unless SATISFACTORY PROOF OF EXEMPTION is provided to Auctioneer prior to payment. If satisfactory proof is not provided, Buyer will pay all applicable taxes to Auctioneer. No taxes will be refunded once the tax has been collected. Proof of exemption, subject to approval by Auctioneer, includes VALID RESALE CERTIFICATES, Ag/Timber EXEMPTION CERTIFICATES, and any other documents as governed by applicable local, state, and federal laws deemed acceptable at Auctioneer’s sole discretion. Taxes are calculated AFTER the buyer’s premium. LOTTING / GROUPING: The auctioneer reserves the right to group one or more item(s) into one or more selling lots, and to add to and/or delete lots and/or offer any selling lots as operating units prior to offering them individually, by the piece, at auctioneer’s sole discretion. The auctioneer reserves the right to reject any bid which is only a fractional advance over the preceding bid. (Auctioneer reserves the right to offer property for sale, first in bulk, and then in lots). DISPUTES: In the event of a dispute among bidders, the auctioneer shall make the sole and final decision to either accept the final bid or reoffer and resale the item(s) in dispute. BUYER’S PREMIUM: The buyer’s premium for each sale will be announced at the time of the auction. Taxes are calculated AFTER the buyer’s premium. Note: Buyer’s premium online generally differs from onsite. The Buyer’s Premium percentage will be posted on the website or announced by the auctioneer. REMEDIES: If any applicable conditions are not complied with by Buyer, then, in addition to any other remedies available to Auctioneer, including and without limitation, the right to hold Buyer liable for the total purchase price, Auctioneer may, at its option, (a) cancel the sale, retaining all payments made by Buyer, including any deposit made, as liquidated damages and/or (b) resell the merchandise at public auction in which event Buyer will be liable for the cost of removing and reselling the abandoned merchandise, for any deficiency between Buyer’s original purchase price and subsequent resale price, Auctioneer’s commission, interest rates (a minimum of 1.5% per month or 18% per annum), legal fees, moving and storage (a minimum of $ 2.00 square foot per month) and all other expenses related to the disposal or reselling of the abandoned property. In addition, Auctioneer may retain any merchandise purchased at auction by a defaulting Buyer as collateral security for Buyer’s obligations to Auctioneer. JURISDICTION & VENUE, CHOICE OF LAW: This sales transaction shall be governed by and construed in accordance with the local laws of the State of Texas, USA if the auction is conducted in Texas If any provision of these Terms and Conditions shall be held invalid, illegal, unenforceable or inoperative, the balance of Terms and Conditions shall remain in full force and affect as if such provisions had not been included. These Terms and Conditions with any amendments or modifications expressly made by Auctioneer at the time of the auction constitute all the terms and conditions with respect to the sale of articles at this auction. There are no representations, warranties, terms, conditions, undertakings or collateral agreements except as herein provided. ACKNOWLEDGE: All Buyers acknowledge and accept by their bid at auction the Terms and Conditions of Sale posted on the website and available at the auction site. ANNOUNCEMENTS: All announcements made sale day take precedence over previously distributed information. Any announcements made on the day of the auction take precedence over catalogue or other previously announced or documented information, but do not alter in any way the basic terms and conditions of sale. Ben H Royston Auctioneers reserves the right to correct any mistakes or typographical errors made by itself or on its behalf in any of its announcements or documents.